Just a few simple ingredients is all it takes to make this Slow Cooker Apple Butter, filled with cozy fall flavors! Slow cooker, crock pot, gigantic dish that sits on the counter and cooks delicious food for hours on end. Whatever you prefer to call it, it’s a kitchen essential for me. I love experimenting with my slow cooker. There are endless combination to make, countless recipes to mark of my to-do list, and so many wonderful meals that come out of it. 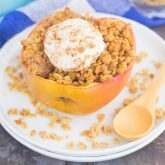 While I use my slow cooker year round, I tend to use it the most during the fall and winter months. I love the ease of throwing something together, letting it cook all day, and having a hot and tasty meal ready with hardly any prep work. It’s almost like a miracle-cooker in my mind! So because it’s fall and I’m all about the apple (and pumpkin) goodies, I decided to try my hand at this Slow Cooker Apple Butter. Just a few simple ingredients is all it takes to make this delicious spread, perfectly acceptable to use on toast, oatmeal, ice cream, or my favorite, a spoon! This Slow Cooker Apple Butter is so easy to make, guys! And you know I’m all about the simple recipes! The hardest part is peeling, coring, and slicing the apples. But if you have one of those handy dandy all-in-one apple corer/slicers, then you’re in luck! I chose to use honey crisp apples, but whatever apple tickles your fancy will work. Make sure that you adjust the amount of sugar depending on the tartness of your apples, otherwise you will end up with apple butter that is either too sweet, or too bland! This Slow Cooker Apple Butter cooks all day, if you have the time. But I chose to speed up the process a bit and cook it on high for five hours, and then on low for one hour, after I had pureed the apple mixture. But if you have the time to spare, cook this delicious spread for ten hours on low. Your house will smell incredible! I also made my butter into more of a jam, rather than a smooth sauce. Simply use an immersion blender or potato masher to mash up the chunks to your desired consistency. I like my apple butter chunky and full of flavor, so I purposely left some delicious gobs of apple-y goodness in there. Did I mention how amazing this will make your house smell? This scent is purely, insanely intoxicating…in a good way! And I guarantee that you will love the taste of this Slow Cooker Apple Butter! While it doesn’t take anything like regular butter (more like an apple jam), it’s full of apple flavor, cinnamon, and cozy fall spices. So what are you waiting for? Grab those apples and get slow cookin’! 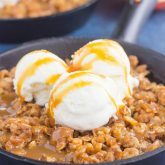 Looking for more easy apple recipes? I’ve got you covered! Spray slow cooker with non-stick cooking spray or use slow cooker liner. Place apples into bottom of slow cooker. In a separate bowl, combine the white sugar, brown sugar, cinnamon, nutmeg, cloves, and salt. Sprinkle over apples and lightly toss to coat. Cover and cook on low for 9 hours or on high for 4 hours. When 1 hour is left, add in vanilla and stir. Using an immersion blender or potato masher, mash apples to reach your desired consistency. Cool completely and then refrigerate until ready to serve. Be sure to adjust the amount of sugar you use based on the type of apples that you chose. The sugars listed above are based on using 5 pounds of honey crisp apples. Apple butter will last up to two weeks refrigerated. You should definitely get another slow cooker, Jessie! I use mine all the time! I've never tried it in crepes, but that's such a great idea! I definitely need to try that! This looks really amazing, Gayle! I love using the slow cooker. It literally is the easiest way to cook. And then I make my husband clean it out. :) I bet this made your house smell delicious. Holy wow! I love that you make your husband clean it. Isn't that the worst part of using a slow cooker? :) My house definitely smelled amazing when this was cooking! Thanks, Ceara! I made mine into more of an apple jam because I love that texture. And it is perfect on toast and so full of flavor! And yes, this smell is a little better than an apple candle, though those are wonderful, too! :) Thanks so much for the pin! this looks great Gayle! I bet it was a super great switch from putting regular PB or butter on toast.... ;-) totally going to pin this and save it for later to try! Thanks for the apple butter love and pin, Michele! You're totally right, definitely a nice change from peanut butter! I also ate way too much of this with just my spoon, it's that good! I used this apple butter for so many things, Laura! This jar definitely did not last long in my house! Ha, that's would NOT stay long in your fridge, blaming this mistake on the ebola (what we're calling the 2 month cough everyone in my area have these days!!) Sure feels like it. Oh my gosh, I need some of that apple butter right now! I want to eat it right off the spoon. Never thought to make that in my slow cooker. Brilliant! I'm embarrassed to admit how much of this apple butter I ate with just my spoon, Liz! It's so good and so versatile! 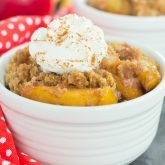 I really love that this is a slow cooker recipe! Looks amazing! I am a big apple butter fan! Thanks, Annie! This was so easy to whip up and so tasty! I am a big fan of slow-cooked apple butter! From the way it makes your house smell, to the unmatchable homemade flavor, you just can't beat it! This looks soooo good, Gayle! Thanks, Sarah! 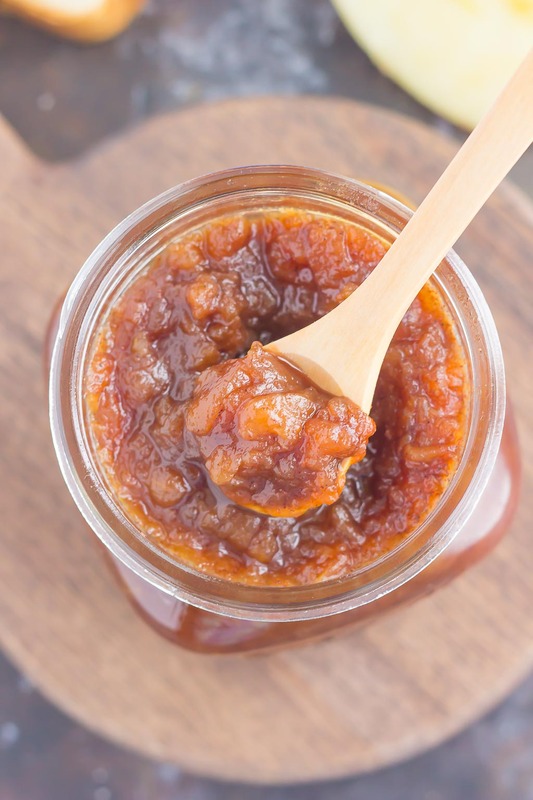 I've made this apple butter a few times this fall since I just can't get enough of it! This apple butter looks so good, Gayle! I love my slow cooker and need to make your apple butter soon! Thanks, Jen! I think you would love this if you tried it! I love sweet apple butter and yours looks chunky and delicious! Great idea to make it in a crock pot, will have to try it! I'm sure your house smelled amazing! Pinned! Thanks so much for the kind words and pin, Mira! I chose to make mine more like a jam, but you could definitely blend it more to make it smoother. But either way, it's delicious! I have never had or made apple butter before. I know I am not the norm. This recipe looks super easy especially because you make it in a slow cooker. Can't wait to try apple butter thanks for sharing! Apple butter is amazing, Kelley! And it's incredibly easy to make in the slow cooker. I hope you love this if you try it! This looks awesome! Love apple butter. And any time I can use my slow cooker and avoid having to stand over a stove, I'm a fan! Thanks, Meg! I agree, I love using the slow cooker because it does all of the work for me! I have to be honest, I don't know if I've even had apple butter before. But it looks and sounds amazing! I'm definitely going to have to put it on the list! Apple butter is life-changing, Ashley! :) It's so easy to make and so tasty, I'm kicking myself that I never made it before this fall! I remember the first time I had apple butter, I was like, "WHAT?!!" I love this stuff! Nice recipe! Apple butter is the best! Thanks, Annie! making these apple butter tonight. I make oatmeal for my son every morning and I keep adding apple sauce to it, this would be so much better and more flavorful. I think your son would love this apple butter, Catalina! 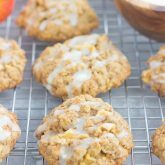 It's so easy to make and so full of apple goodness! I love apple butter! The perfect spread for my toast! :) Can't wait to try your version!!! Isn't apple butter the best? I hope you love this if you try it, Olivia! I don't have a slow cooker but I bet this tastes amazing. I love apple butter, perfect for spreading on my toast! Great recipe Gayle! And what a great giveaway! 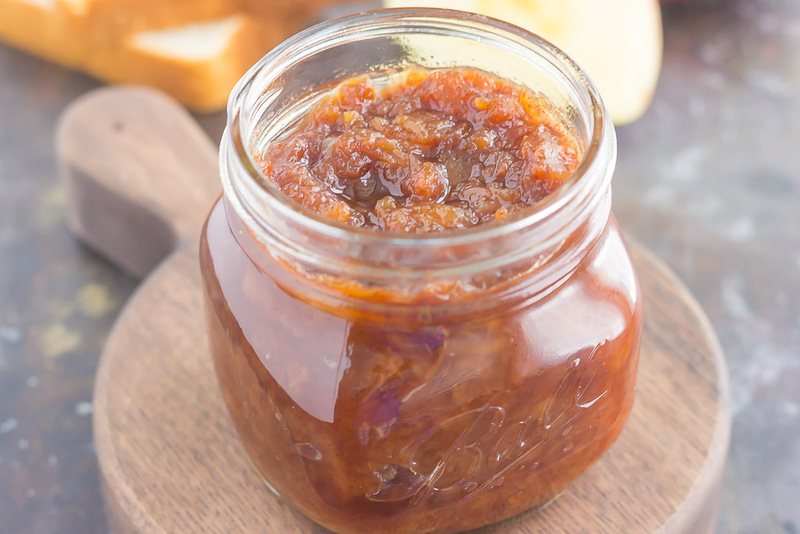 This apple butter is perfect on just about anything, Manali! Thanks so much for the kind words! 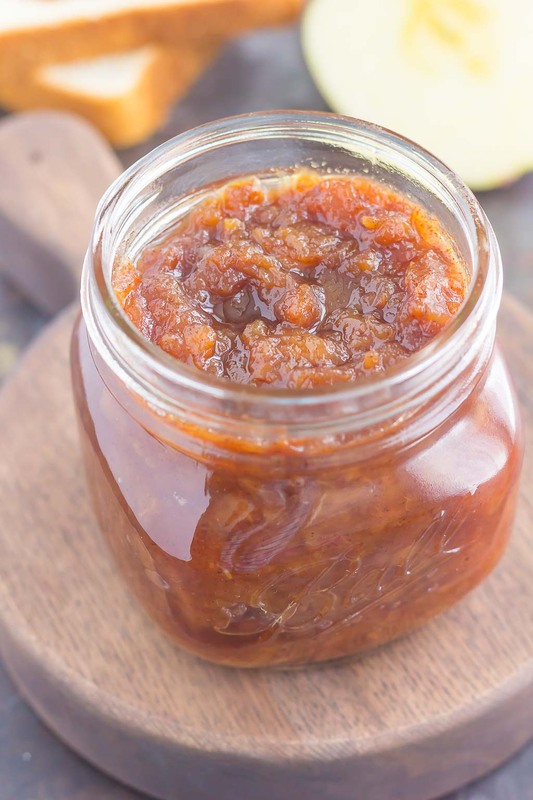 This apple butter would make the ultimate fall condiment, and I love that you can make it in a slow cooker! This looks so tasty, Gayle! Thanks, Marcie! Anything that requires a slow cooker is a winner in my book! I agree, Danielle! I would be lost without my crock pot! Thanks so much for the apple butter love and pin! Gayle, I absolutely love how you left the apple butter slightly chunky! I make homemade applesauce and do the same thing. I hadn't ever heard of apple butter until moving to Ohio and meeting my husband. His family uses it on cornbread... I will definitely be trying this, as I have several pounds of apples from the orchard just hanging around the house. I love chunky applesauce, too! I usually buy apple butter in the fall whenever we go to an apple orchard or pumpkin farm, but I decided to make my own this year. It was definitely worth it! So easy and so delicious! I hope you love this if you try it, Heather! Gayle this apple butter looks beautiful! And it's even better that you can make it in a slow cooker, how awesome! Thanks so much, Christina! This is definitely a slow cooker winner! I can't imagine not having my slow cooker, Nicole! I use it all the time! I hope you like this apple butter if you try it! Crockpots are just the best! I have yet to make apple butter in mine though - that must be fixed! Love this! Thanks, Ashley! This apple butter turned out fantastic when made in the crock pot! Slow cookers are a life saver - we would have no dinner most days without one haha. I have never tried making apple butter in it though - love that idea! I can just imagine how incredible your house smelled - yum! Pinning! Slow cookers are definitely the best! And the scent from this apple butter was amazing! Thanks so much for the kind words and pin, Kelly! Thanks for such a fun giveaway Gayle! And what an awesome recipe, I can't get enough slow cooker recipes, I love them!! That apple butter has a rich, beautiful color! I love it! Gayle, what a wonderful giveaway and recipe!! I imagine this makes the house smell heavenly! I love anything I can use my crock pot for! Hope you have a fantastic week. Thanks so much for the kind words, Serene! This apple butter was a great excuse to whip out my crock pot. Have a wonderful week, too! Yep, has to be Honey Crisp! All the way!! This looks so wonderful, Gayle! I looks so rich, and I love the little apple chunks. I have to try this! Honey crisp is the best! And I love chunky apple butter and sauces, it seems to give it more flavor! I hope you love this if you try it, Sarah! I can't believe I'm going to say this but I've never had Apple Butter! Love this option for the slow cooker! I think you would love apple butter, Julie! And it's amazing when made in the slow cooker! Isn't it the best? I love making it in the crock pot, just so easy! Such a beautiful color, I bet your kitchen smelled heavenly. Never thought to use a crock pot for something like this. Great give-away! Thanks, Cheri! Apple butter was made for the slow cooker! This apple butter looks amazing Gayle! I made some in my slow cooker earlier this year, and we loved it, but it didn't look nearly as thick as yours. Maybe I didn't cook it quite long enough! I'll have to try again with your recipe I think! Thanks, Stacey! I chose to leave mine thicker and didn't blend it as much, as I like my apple butter chunky! I luuurve apple butter! And I love that you made it super easy with a slow cooker. I am not in love, however, with my slow cooker. It hates me. Maybe I should try something that I can't mess up, like your apple butter! Pinned! Maybe you need to try this apple butter in your slow cooker, and it might just like you forever! :) Thanks for the pin and kind words, Lindsey! Every year I say I'm going to make apple butter but never do. I must after seeing your recipes. Great give away Gayle. Thanks, Kathy! This is just too easy to make, I think you'll love it! This was my first time making it and I have to say, definitely not the last! I hope you love this recipe if you try it, Vanessa! This looks so doable and delicious!! You know I've seen apple butter around, but I've never made it before! I think that needs to change. I can see so many uses for this from pork chops to chicken to over yogurt. Pinned! Cheers to a fab weekend, my friend! You would love apple butter! I could eat it with a spoon! :) Thanks, Dawn! We're both pulling out the Crock Pot this week! :) Slow cooker apple butter is one of my favorite ways to use up all of the fall apples that we inevitably pick. Your new photos look great! Yay for slow cooker recipes! Thanks, Blair! Oh, I LOVE APPLE butter! I legit just used some in a recipe yesterday! I MUST try your recipe, Gayle!! I adore how easy it is!! Pinned! Cheers, friend! Oh gosh, yes!! 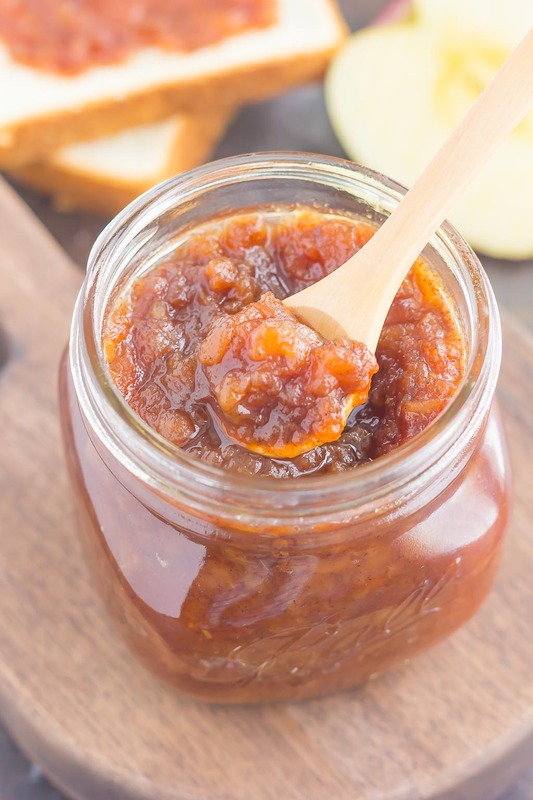 Slow-cooked apple butter is EVERYTHING! I will seriously eat it straight outta the jar if I'm allowed to. LOL. This looks like a must try, Gayle! Straight out of the jar is the BEST! Thanks, Sarah! OMGoodness!! Who doesn't LOVE apple butter, totally deeeelicious! I really like your crock-pot idea and the super easy clean-up. I use crock-pot liners like crazy, they really do work. My clean-up time is cut way back with those little beauties. I'm thinking of maybe mixing up a variety of apples....maybe will work out? Good thing is that I do happen to have loads of honey crisp apples. Have a nice day Gayle! Aren't crock pot liners the best? I couldn't live without them. Mixing up the different types of apples will definitely work. Hope you love this and thanks for stopping by, Dalila! Apple butter is one of the best parts of fall! Love this slow cooker version! YUM! Homemade apple butter is my favorite! Looks amazing! Love the new photos! Thank you! This looks amazing. I’ve been looking forward to this recipe. Can't wait to try this out. Thanks for the sweet comment and for stopping by, Bonnie! Hope you love this apple butter!